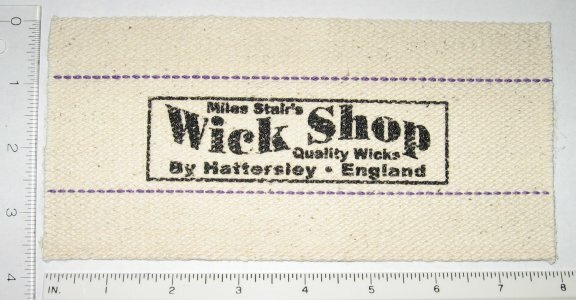 WICKS TO FIT THE HEATERS LISTED BELOW - AND MORE! 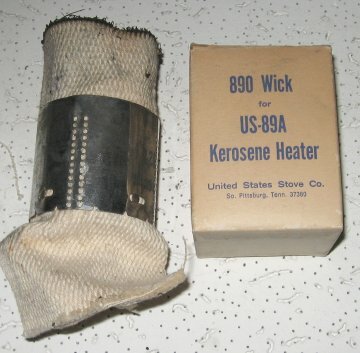 Kerosene Heater Wicks (To find a wick for your heater, click here.) 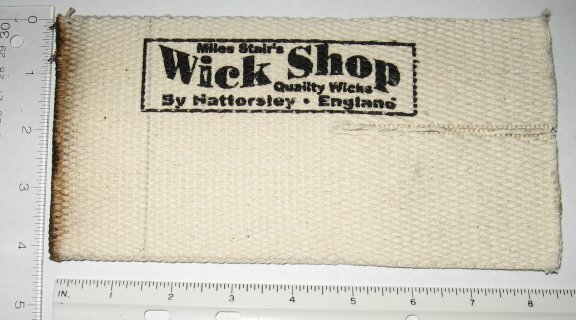 Photos of all wicks, click here. 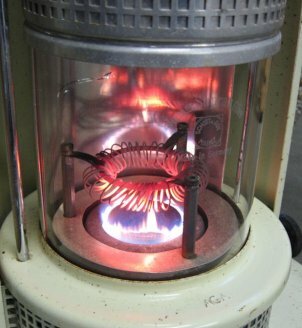 Kerosene heater wick - no pins: a normal fiberglass-topped heater wick without pins. 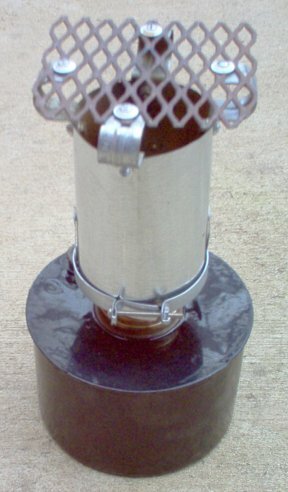 Kerosene heater wick - with pins. 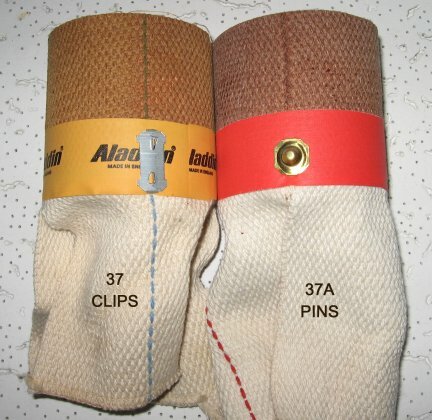 Note two pins are showing; on the left the pin height is illustrated. Perfection 500 wick - Original. 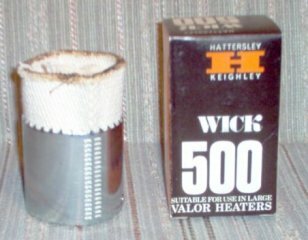 "Perfection 500" heater wick from Hattersley. 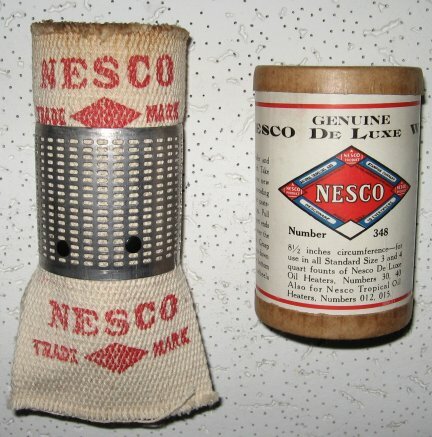 "Nesco" wick, a clone of the Perfection 500 wick. 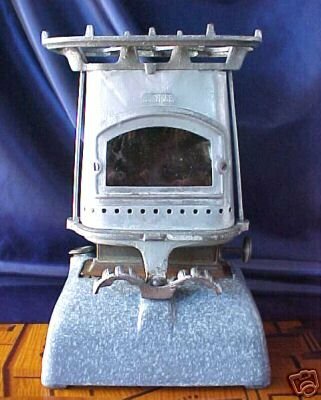 US Stove Co. Model US-89A wick. 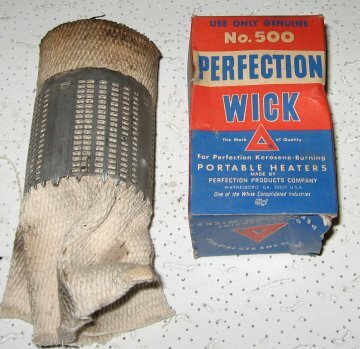 Perfection 400 wick, for 300 and 400 series heaters, no tails. 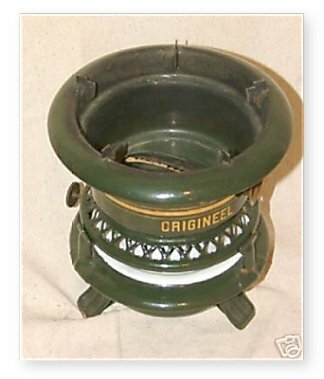 3L - 2 9/16" Store Lamp Center draft circular wick; Rochester Lamp Co, Bradley & Hubbard #89 & 96, Miller #3, Juno #3, #3 Banner and Standard store lamps (4 3/16" wide and 8 1/2" flat) Photos of other wicks - click here - listed by wick number. 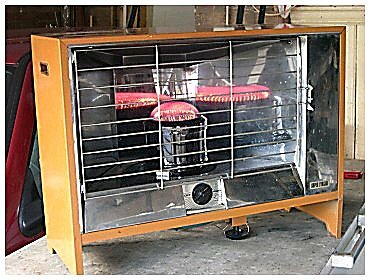 AGA Heater, and closeup burning. From The Netherlands. Photo courtesy of Manfred Koster. 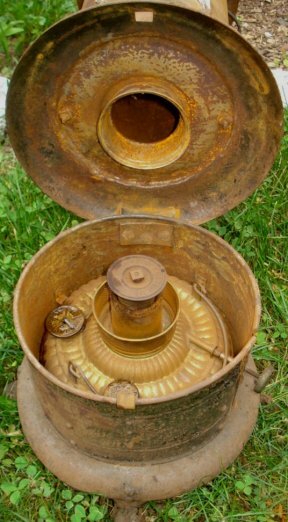 AGA Oil. Photo courtesy of Manfred Koster. Aladdin Blue Flame - generic photo of the style. 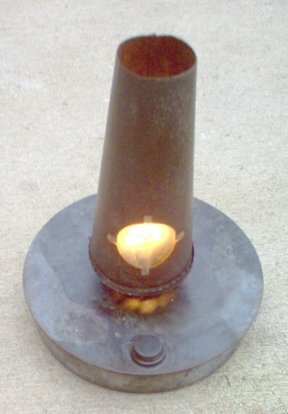 A brass Blue Flame owned by Dennis Anderson. Aladdin Series 7. Photo courtesy of Manfred Koster. 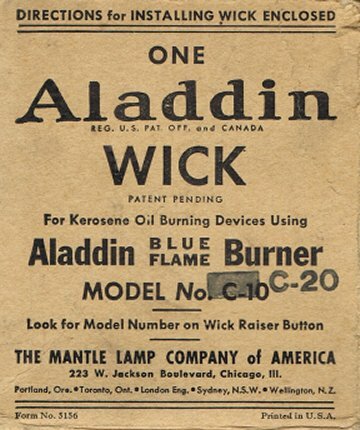 Aladdin Blue Flame, all brass. 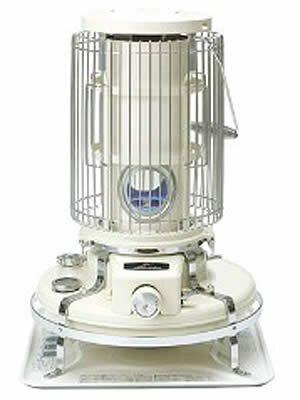 Aladdin S181U Tropic heater, an unusual round radiant with a steel catalytic converter and bottom tank. 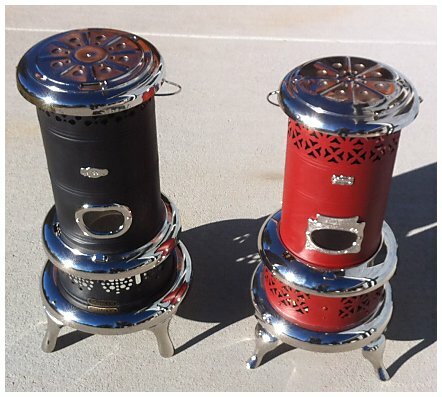 The Tropic will work as an emergency stove because it has no glass parts or insulation over the catalytic converter, and the low heat output is ideal for survival rooms, motor homes or travel trailers. From my collection. 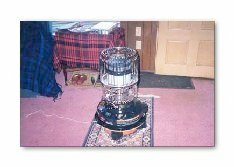 Aladdin TR2000 heater, a small radiant using a wick of only 2 1/16" diameter and a glass chimney within a deep parabolic reflector, almost a "personal size" for arthritis therapy and heating a small room. 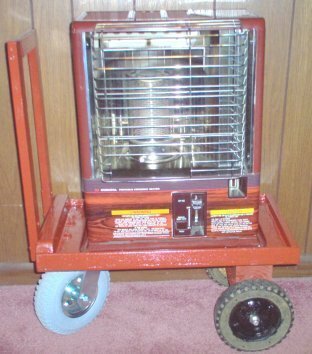 The heater is set up on an inexpensive Harbor Freight hand truck/cart with a 16 1/2" x 23 1/2" plywood base for easy moving to where it is needed. From my collection. 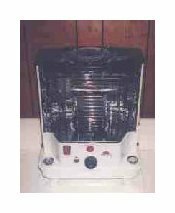 Auto Motor Heater instructions, and Primer Wick availability. 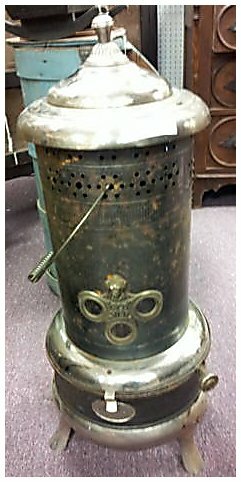 Beatrice Boiling Stove, label reads Harper-Beatrice, uses a 4" flat wick to produce heat for cooking and heating a small room. 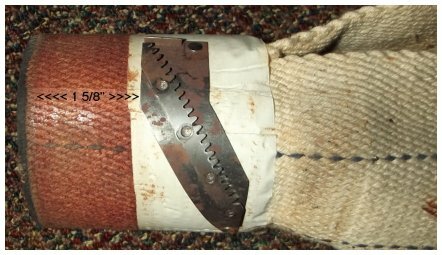 It had only been used a few times when I found it. 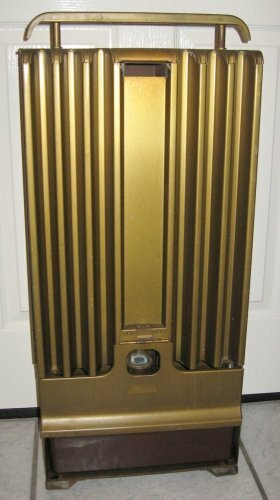 Beatrice Parlor Heater Model No. 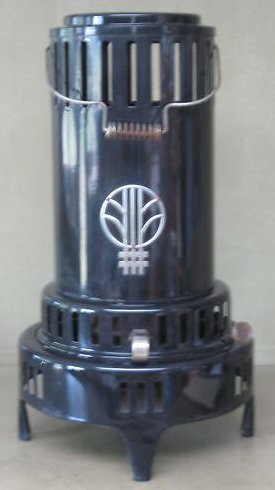 4012, English-made heater using a small diameter circular wick. 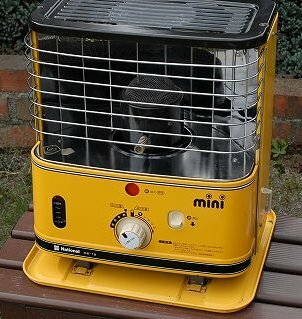 Probably 50 years old and I will have to rebuild it, but it is a fine example of small British room heaters. Beatrice No. 4012 compared in size to Perfection 730. From my collection. 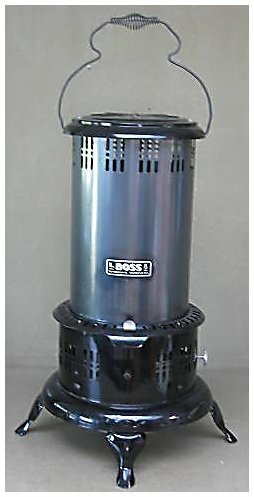 Boss kerosene heater, essentially a copy of the Perfection 500. 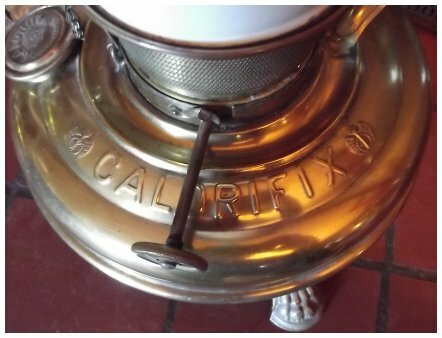 Calorifix (Made in Germany by HASAG). Photos: #1, #2, #3, #4. 71mm wick available, click here. 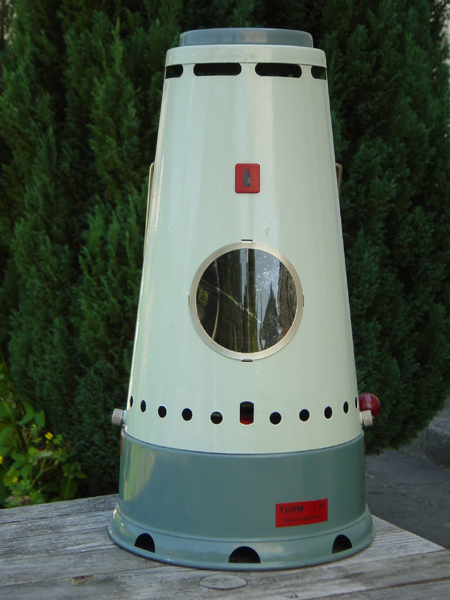 Canaveral Model 8500, (Made in Germany by TURM.) 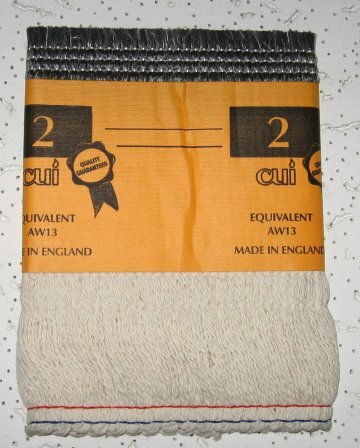 US Distributor, Robert Evans Co., Jacksonville, FLA. 71mm wick available, click here. 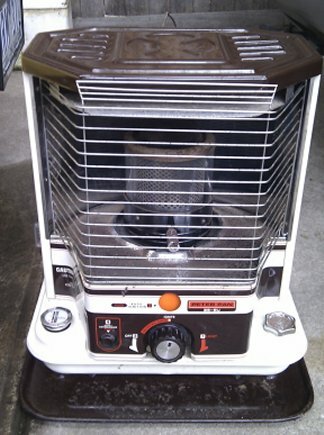 Corona SX-2E radiant heater on cart. From my collection. Email YRJ9000 Sold in Australia. 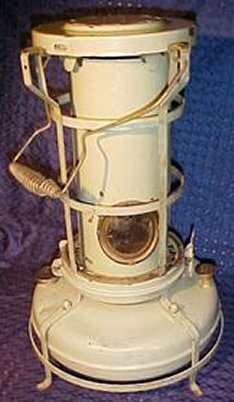 Everglow P-E3, Another unusual Everglo heater. Owned and photographed by Mark Bartlett. Everglow P-E12 normal view, and front panel removed. 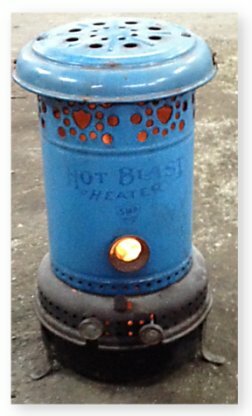 A most unusual radiant heater. 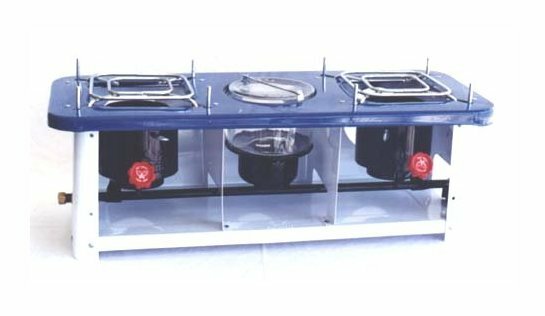 It appears to be a regular radiant heater, but the lower front panel removes to reveal a bottom fuel tank with everything attached. 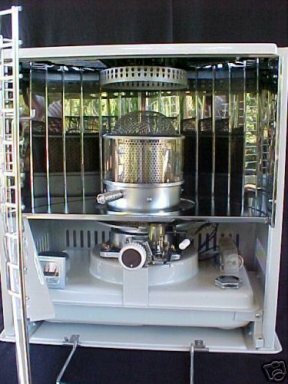 The entire assembly can be removed as one piece for cleaning and service. Excellent design! From my collection. Facetta. Facetta open. Facetta manuel. 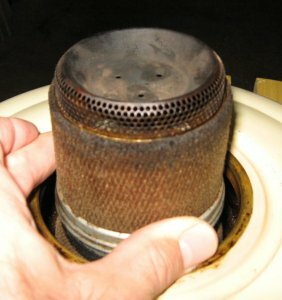 "Golden Crown Combo" heater. 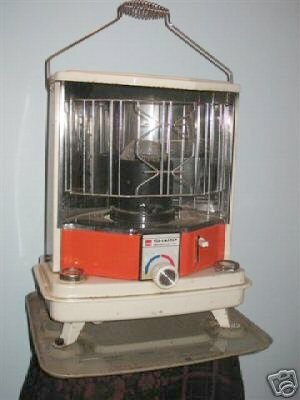 Unusual flat wick heater from The Netherlands. From my collection. Grand #8. Unlighted. Before restoration. Photos by owner who restored this beauty, Douglas Remsen III. Wick for Grand #8, click here. 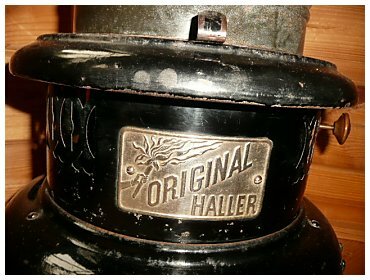 Haller "Original" Heater (Netherlands); close up burning, wick position up, down. Photo courtesy of Manfred Koster. 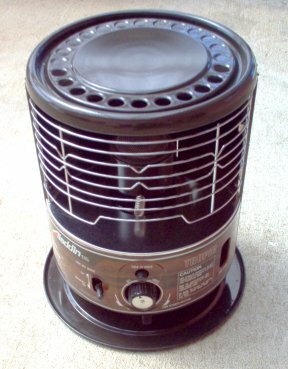 Haller Stove/Heater combination. Photo courtesy of Manfred Koster. 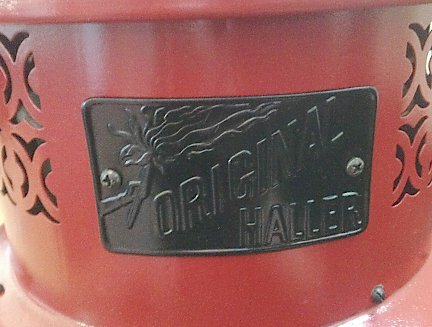 Haller "Original" Heater (Germany). Name plate; burner. Hamburg Altona/Ottensen Germany, circa 1925 - 1945?. Photos courtesy of Rüdiger Pech, Germany. 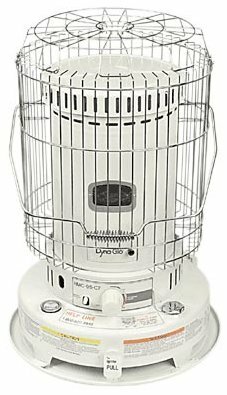 This heater uses the C71 custom wick. Heaters from the Netherlands. Photos courtesy of Manfred Koster. 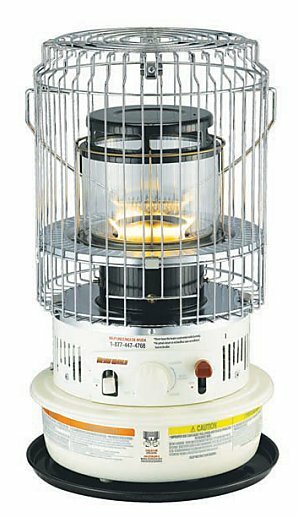 Heat Mate HMHR 1101 radiant heater. 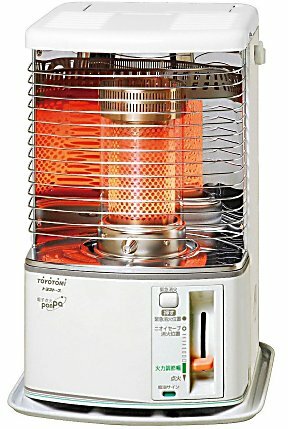 A very fine heater at a reasonable price. I've used this one for over nine years. Heat Mate H-110. Also sold as a Sengoku. 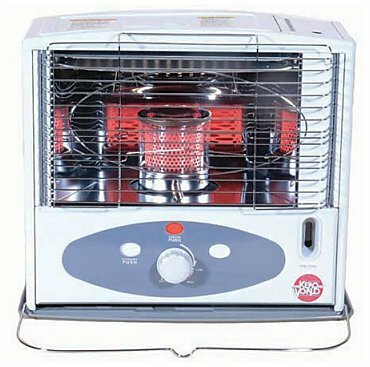 Heat Mate CV-2230 convection heater. 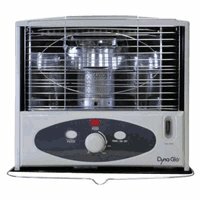 The best buy of new convection heaters. 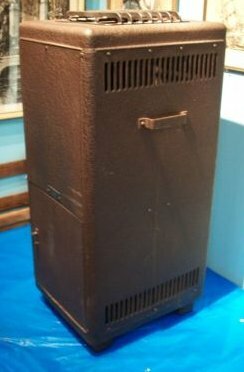 DC-100 convection/radiant heater on dolly. From my collection. DC-100 on wagon, back view. I made the wagon using the wheels, axles and tongue from a discarded child's wagon. The plywood bed is 19 1/2" wide x 22" long. Moonlighter. 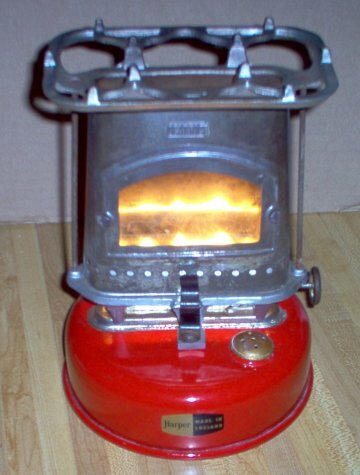 KeroSun. Nickel plated. Owned by Alex Muzyka. 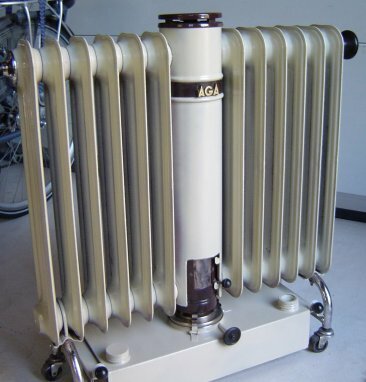 RCA-87 radiant heater. Was part of my collection. 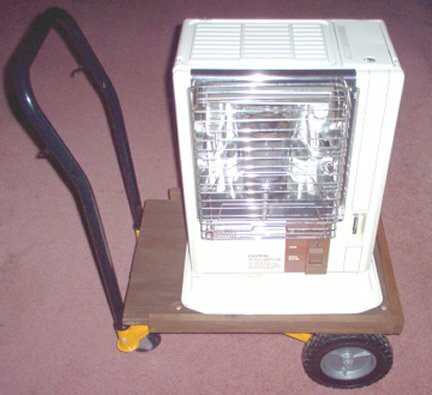 WC-105 Type N on cart built from a inexpensive Chinese hand truck. 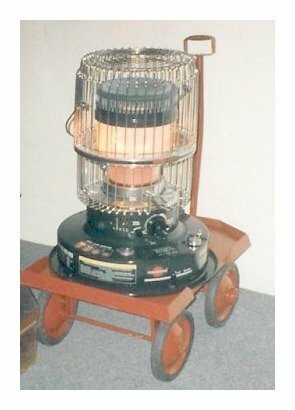 In the summer, this cart sees duty as a beehive work cart. From my collection. 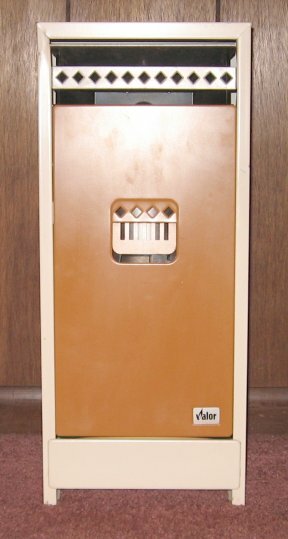 Decal label on WC-105 heater showing the last letter denoting type "N". 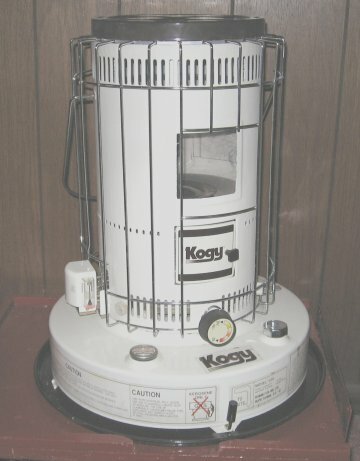 KOGY 100 - An exceptionally well-designed and -built heater from Taiwan. 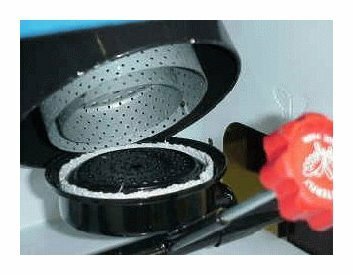 The iris-style emergency shut-off is crafted like a watch, covering and sealing the wick instead of the usual wick-retraction system. Marin m 3000, a re-badged Corona 12DK. Uses wick #30. Malleys Warma. Operating instructions. 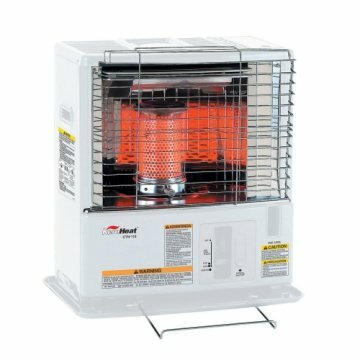 Information on Aussie heaters page. 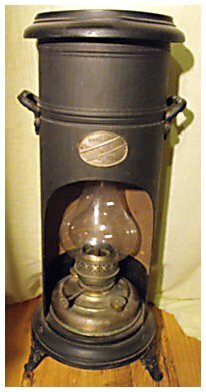 Marshall Wells No 33 heater Patent Oct 26, 1897. Font and wick sleeve. 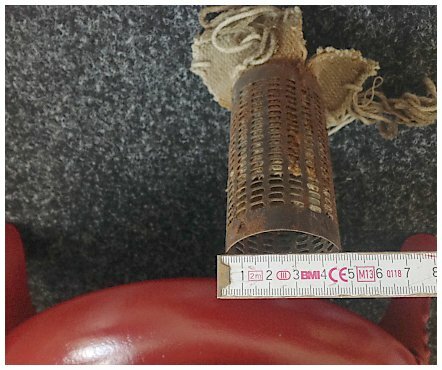 The wick tube is 4.75 id and 5 inches tall. 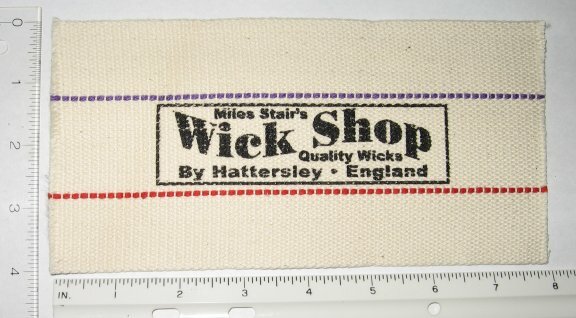 For wicks, click here. Nissei "Miky Oh," "Hyper Clima." 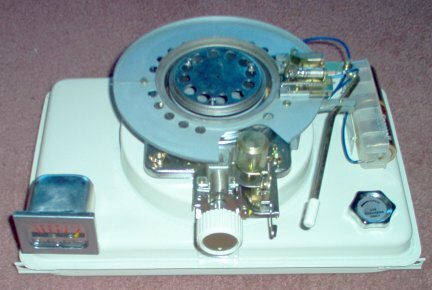 National OS-12 "Mini" made in 1978. 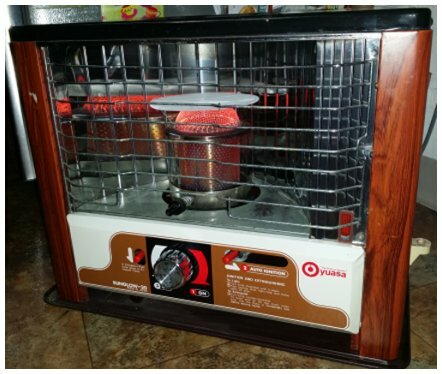 Sold under the Panasonic brand name in the US. Panasonic OS-1000R. Also sold as Email 545 YRJ9000 and Fyrside YRJ 9,000 (in Australia), National OS-201R, OS-206R, -208R, -212R, and OS-1,000R (in Japan and South Africa). 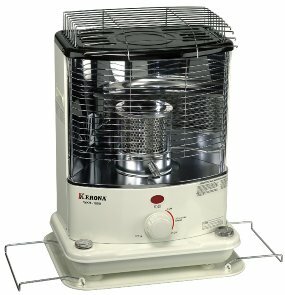 I am trying to get wicks for this heater. 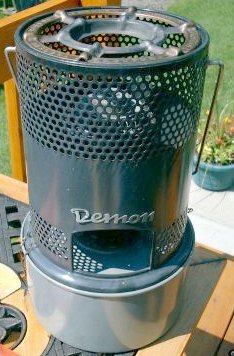 Phoebus Demon heater. 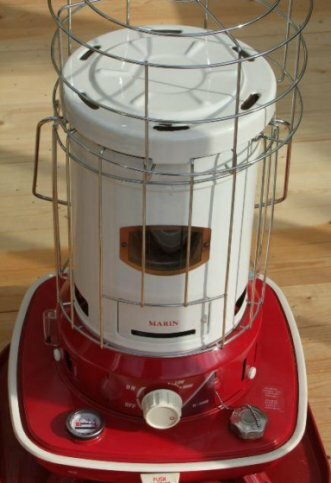 A small, rare heater made in Austria for heating seasonal cabins in the Alps. 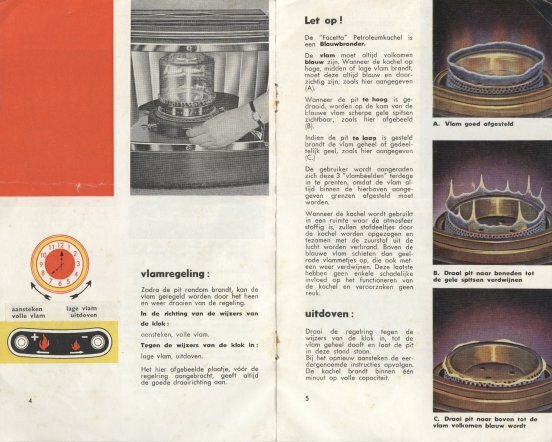 Record heater brochure, operating instructions. Very rare, made in OZ. 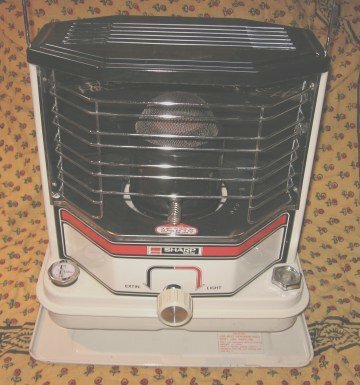 Sharp-Pechka radiant heater sold in Canada in the 1970's. From my collection. Sharp HSR-88F, made in January, 1981. 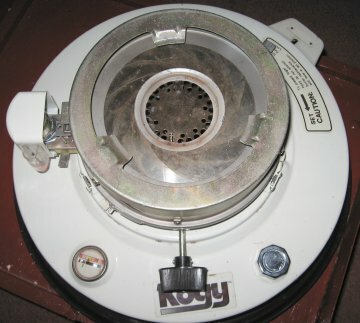 These were sold in Canada and do not have UL approval, lacking a tip-over switch. 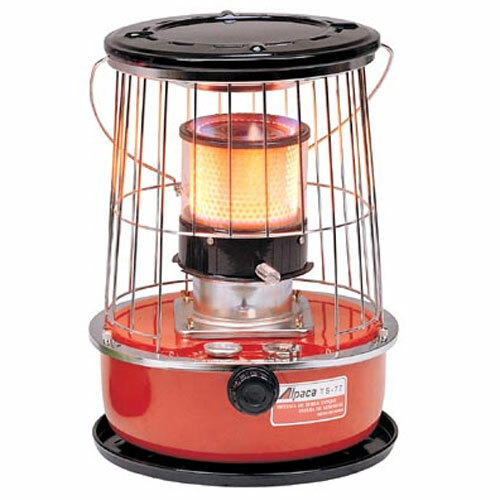 With the bottom tank and a nice carry handle, this heater would be ideal for a fishing hut or some other purpose where the heater would have to be carried and move frequently, as the bottom tank is far less prone to spill fuel when moved. I purchased and refurbished it just in case someone wanted it for that purpose. 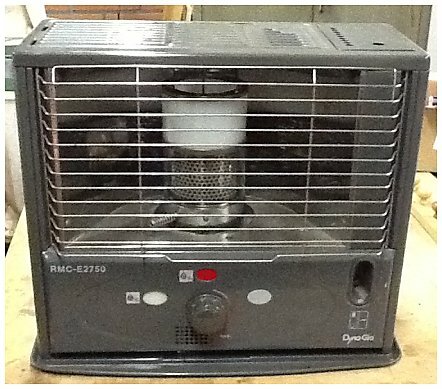 SMP "Hot Blast" heater. 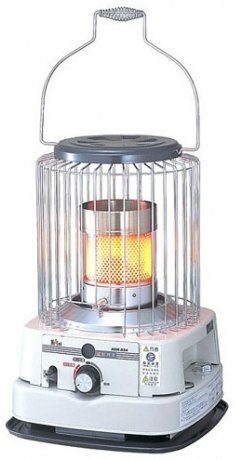 Same as the GSW Hot Blast heater. Sunbeam OHR G28HN, photo thanks to Tony. 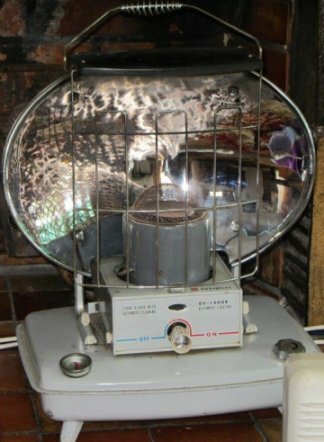 Tony Sun radiant heater, made in China, and not very well. No longer a part of my collection. 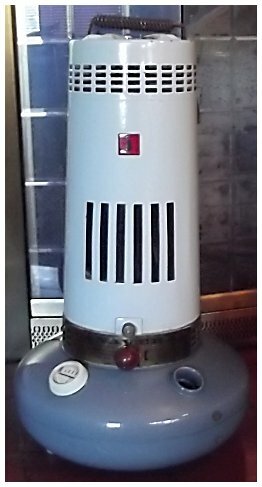 Turm L51 Blaubrenner (Blue Flame Heater) (German) burning my new wick. From my collection. 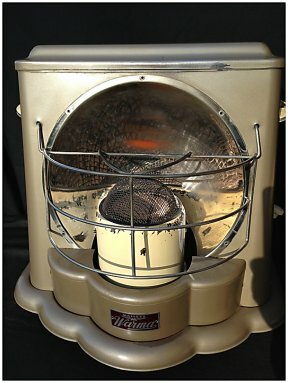 This heater is currently being sold in the US as a military surplus Swiss or Swedish "Tent Heater: Consumption per hour approx 0.35 pints .approx 6500 B.Th. U's/hr per filling appox 16 hours burning time." 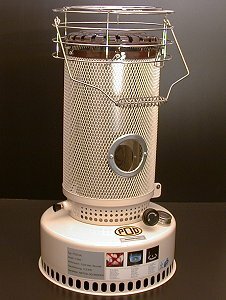 Video of heater burning > http://www.youtube.com/watch?v=UZWZBm5Jfvs Photo of heater > http://www.prela.ch/images/Turm2Gross.jpg Wick available, click here. 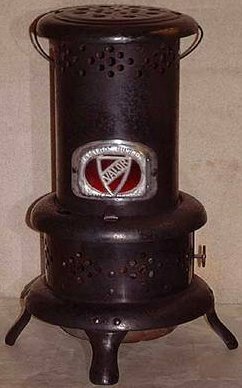 History: Turm is a brand name of Meyer and Niss from Hamburg, which since 1910 to the end of the 60s produced among other things petroleum furnaces and spirits. 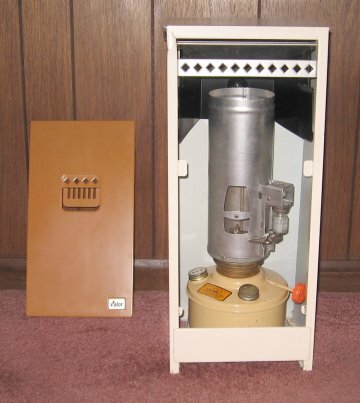 The best known is the tower kiln L 51, which was used as a petroleum heater in the Swiss army. 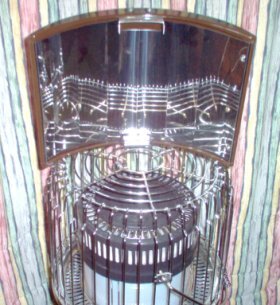 In the early years, however, the design was similar to the heaters of Adolphi and Haller, all of which were also based in Hamburg. 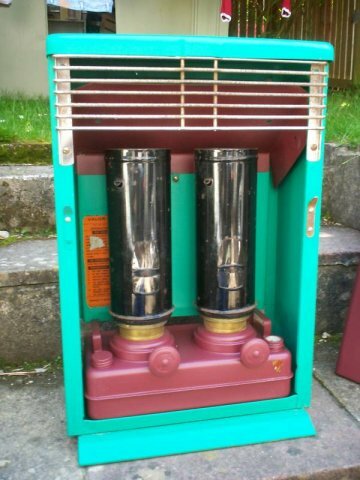 From these developed the likewise popular and widespread tower "Grünrock", according to its green-black coloring. 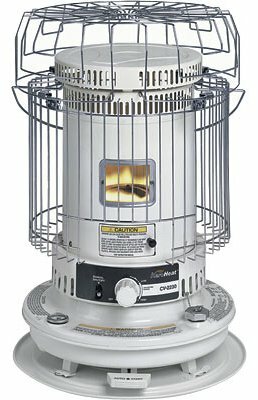 Valor 525 heater, essentially a copy of the Perfection and using the Perfection 500 wick. 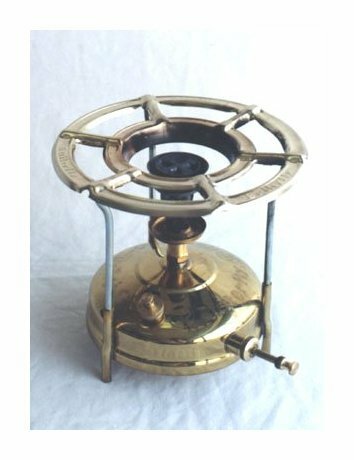 This is one of the very few Valor heaters which used a commonly available wick, their other models being designed for unusual proprietary wicks. 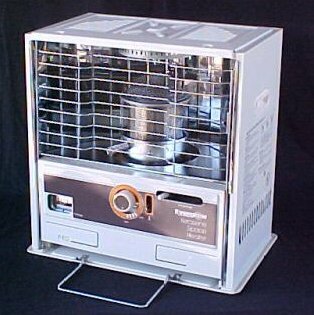 Valor 525 burner unit with wick. Valor No. 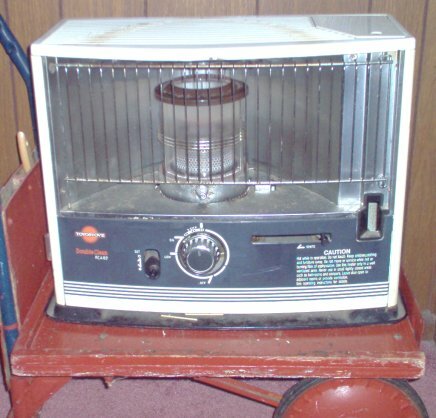 420 Parlor heater. 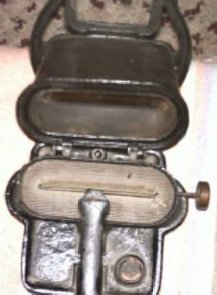 Front cover removed to show burner unit. From my collection. Ward's Porto fount. No wicks available. Wild Country, sold in Australia. 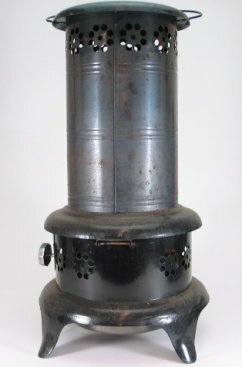 Bradley & Hubbard "Smokeless Heater." 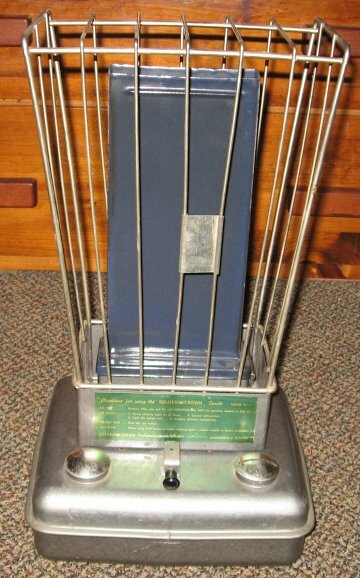 Bradley & Hubbard Model #5. 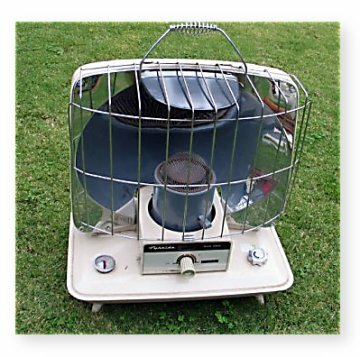 Califorix heater. #2, Compared to Haller. 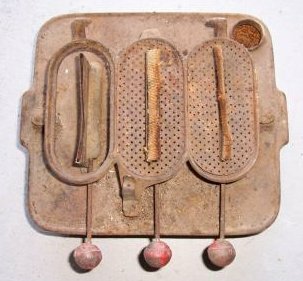 Made in Germany by HASAG after 1899. 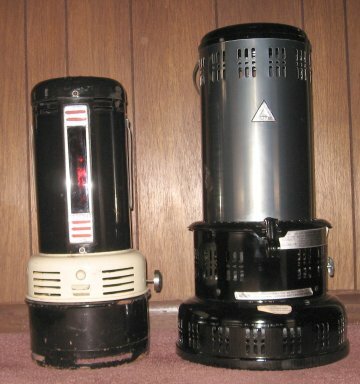 These heaters used a 71mm wick. 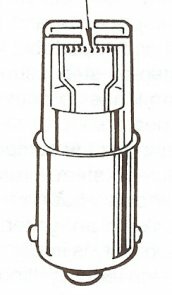 The draft tube is 2.664" diameter, compared to 2.50" for a Perfection heater. 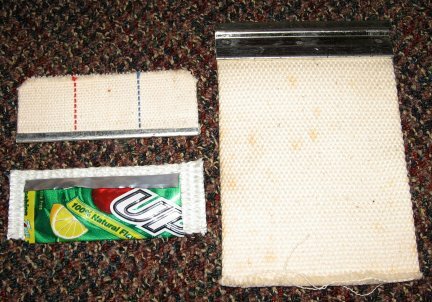 A Perfection 500 wick must be removed from the carrier, a seam opened and then loosely sewn back together. From my collection. 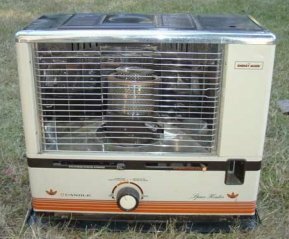 "Century 20" heater. Unlighted. 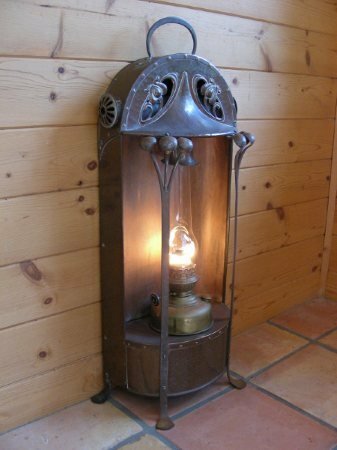 A 20''' Veritas lamp insert in a beautiful old "parlor stove." Owned and photographed by Scott Gray. 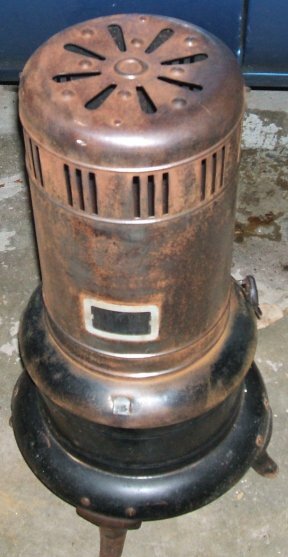 Chautauqua oil heater. Burner photo. 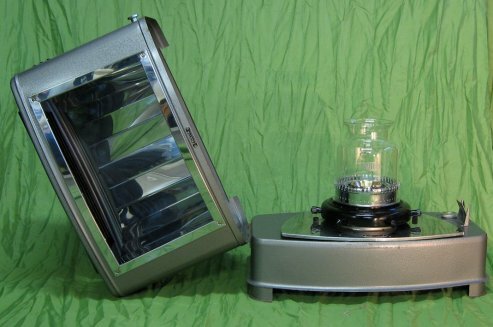 Globe Incandescent, shown open. 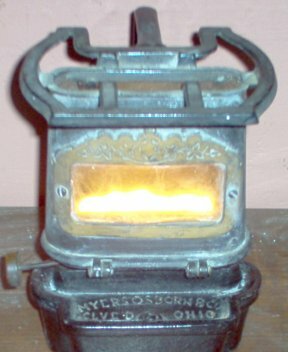 Made by The Standard Lighting Co., Cleveland, Ohio. 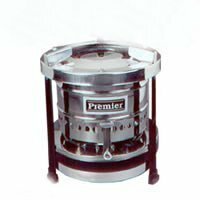 Butterfly #2412 pressure stove (best backpack kero stove) From my collection. Butterfly #2418 (two burner, center tank) From my collection. 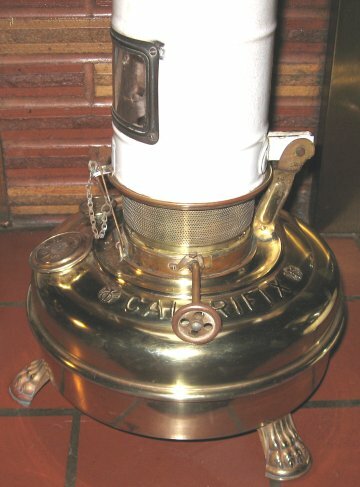 Haller "Origineel," a German stove. 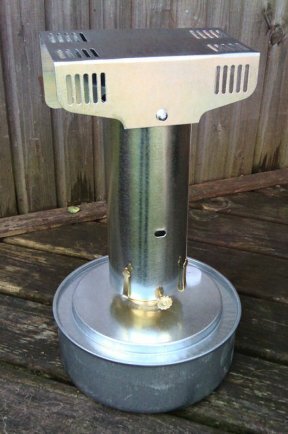 This is a small stove, about 6 x 9", and uses a thin 2 9/16th wick. More photos and information here. From my collection. 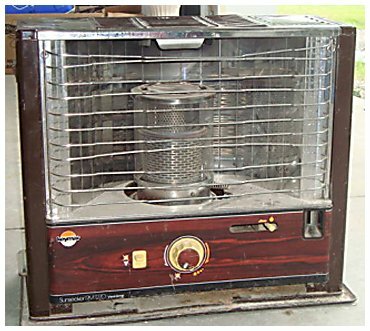 Harper Beatrice "Boiling Stove", made in England, probably post war, likely used as a "caravan" heater and stove. 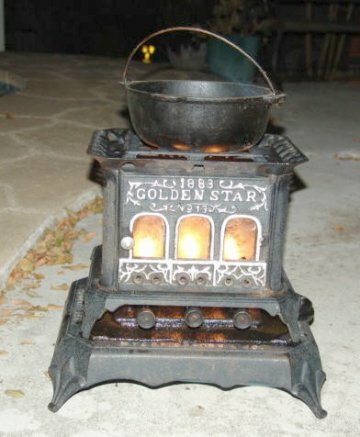 Essentially, this is a very successful update of the 1880's "sad iron heater" such as the "Golden Star." 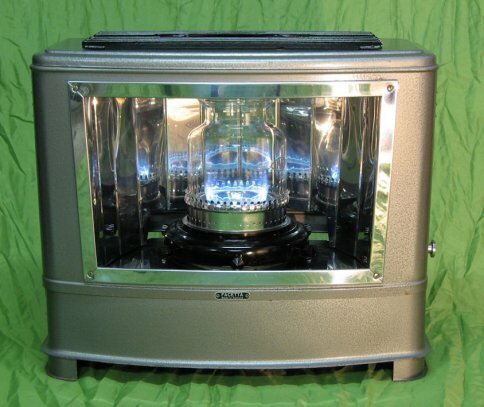 This heater uses a 4" wide wick cut from the B&H lamp wick. 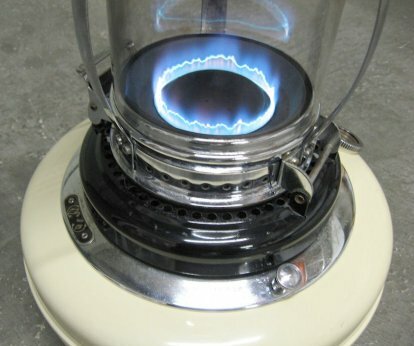 It can boil a teakettle of water in 10 minutes - with no fumes or soot. 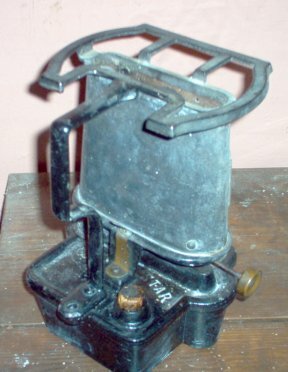 Virtually identical to an all-brass stove made in Germany circa 1900. From my collection. 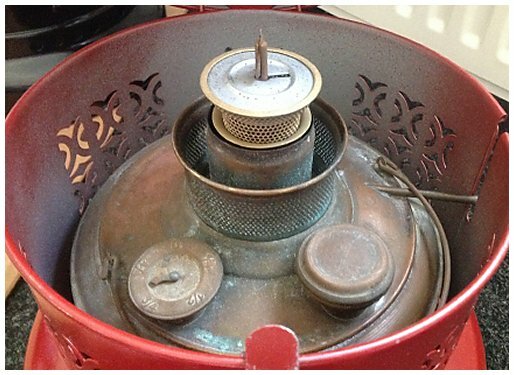 Beatrice "Boiling Stove" dated 1901, with a cast iron base. Note chimney is identical in style, above. 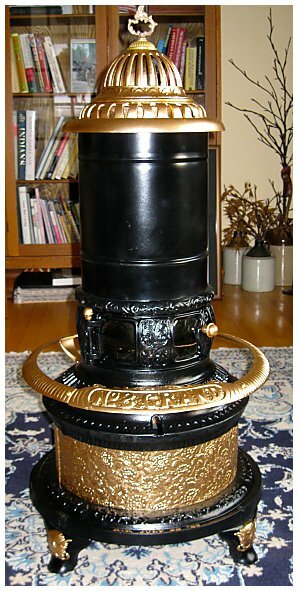 Beatrice #33 "Boiling Stove," dated 1901, with an enameled base and rare top plate extensions. Photographed next to my Harper Beatrice to show the size difference. From my collection. 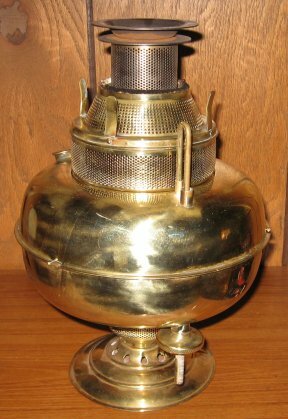 Karan 212 (Golden Night) (#2 burner, high heat output) From my collection. Premier Jr. (8 strand wick design) From my collection. Premier Sr. (10 strand wick design) From my collection. Swastik (12 strand wick design) From my collection. 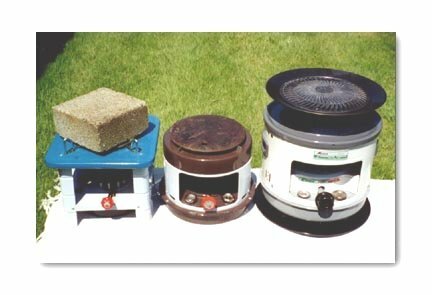 Stoves as heaters (various types of heat sinks on stoves) From my collection. 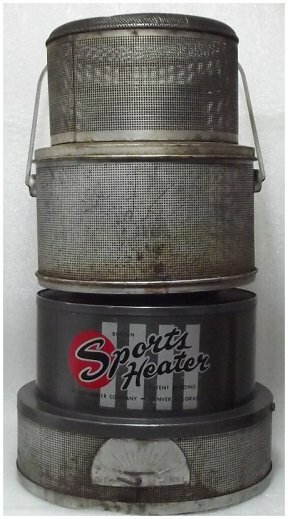 Mini stove I made using a P&A Brooder House Heater as the base, using expanded metal as a cook surface. 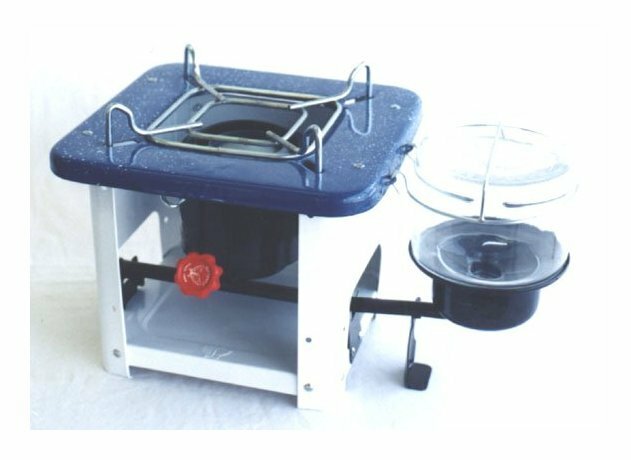 Mini stove I made using a P&A Brooder House Heater as the base, but using an electrical switch cover as the cooking platform. 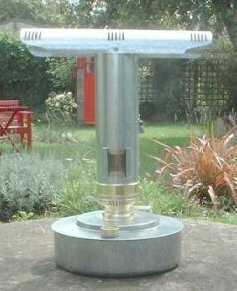 Note that this unit should be used outside until the galvanizing is burned off. 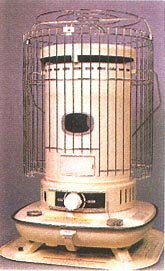 Brooder heater, not a P&A, with original chimney and mica window. 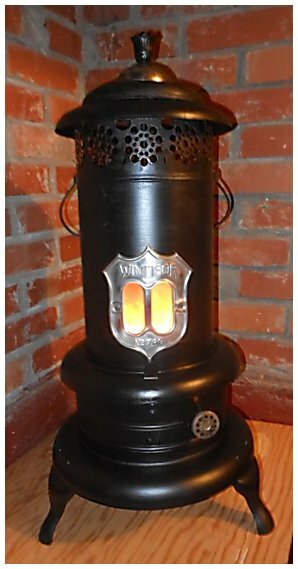 Sad Iron heaters and mini wick stoves from the 1880's up, American and European. 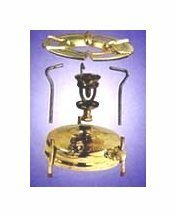 Single wick "Golden Star" stove, front, back, open. From my collection. 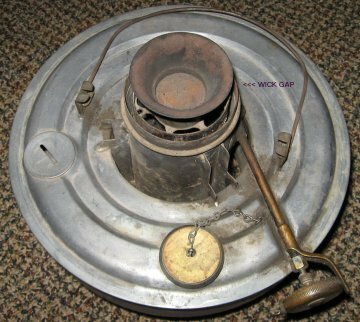 Three wick "Golden Star" stove, front, and another three wick open. 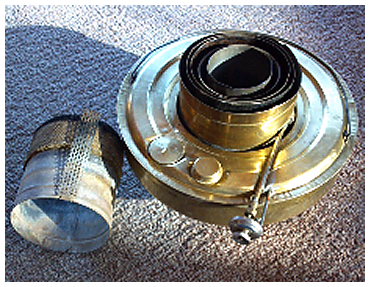 Pocket kerosene stove from WW I era, folding for easy carrying. Quite rare! 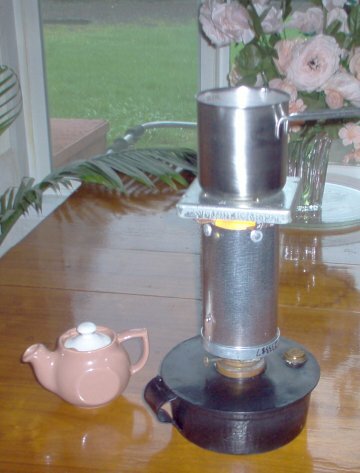 A stand unfolds from the lid for balancing a small pot or canteen. 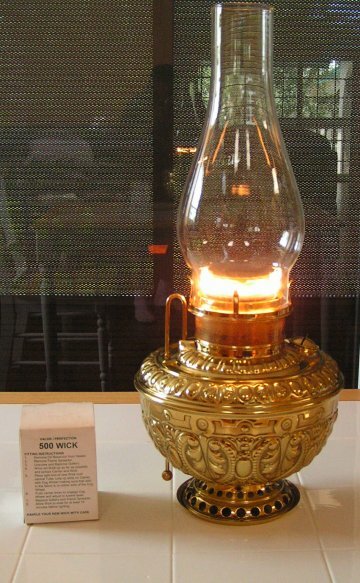 The brass cap on the lower right screws tightly over the wick so kerosene does not leak during carrying. 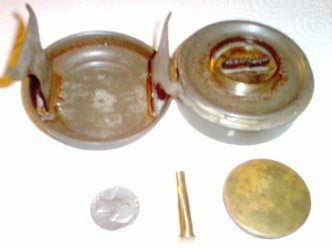 A US 25 cent coin and a WW I era .25-20 Winchester cartridge case are shown as comparison for size. 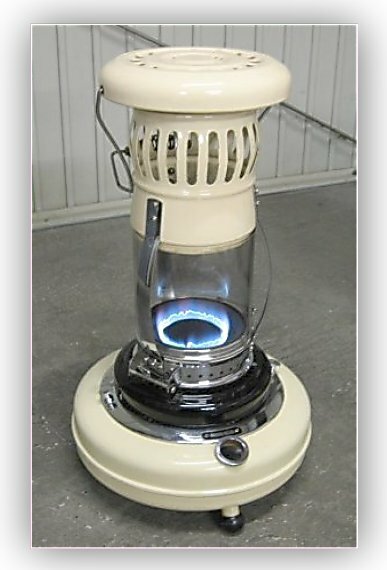 This little stove uses a 1 1/2" section of lamp wick to produce heat - not much - but it is an interesting piece of history. From my collection. 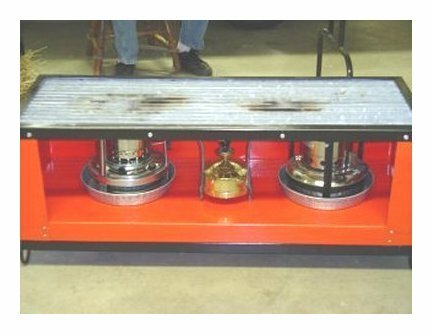 Sepulchre Heating Table. Owned, restored and photographed by Manfred Koster. 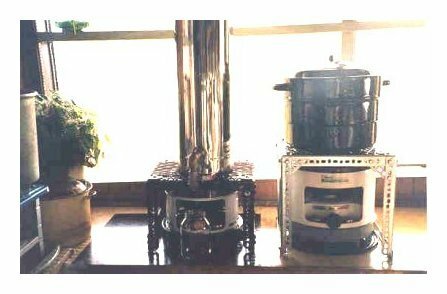 "EcoFan" for wood stoves. 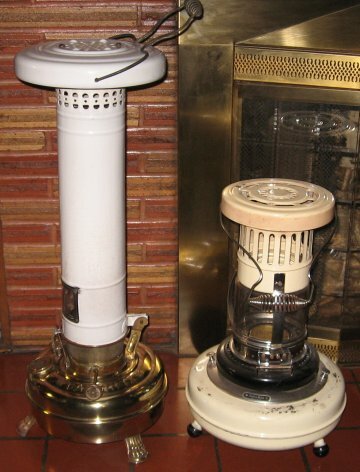 The difference in temperature between the base and the "fins" on the top creates enough electricity to turn a fan and circulate heat. 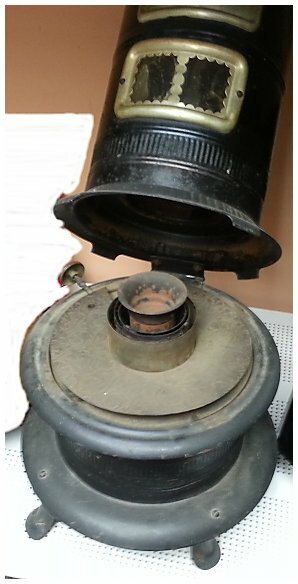 This fan has very limited use for kerosene heaters: It cannot be use on a convection heater; it can be used on some radiant heaters which are not insulated on top, but not over open vent holes directly over the catalytic converter. 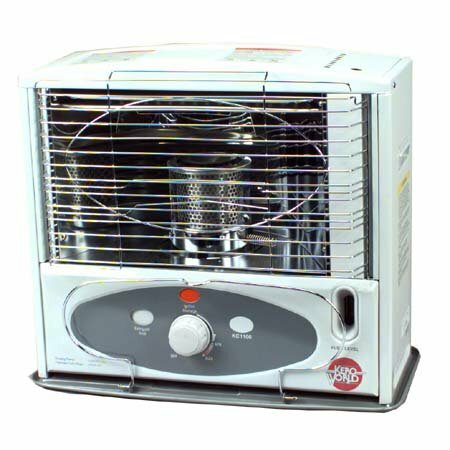 It works very well on an Aladdin Tropic, but the photo shows it cannot get enough heat to move on the well insulated Aladdin TR2000. From my collection. 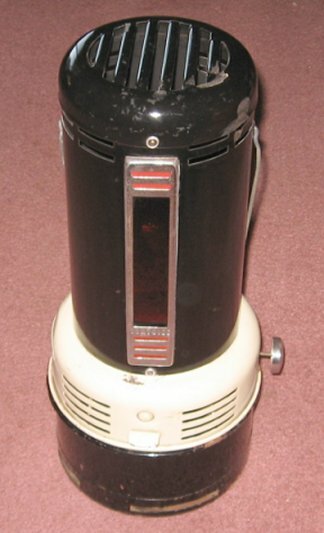 Kerowind electric fan. 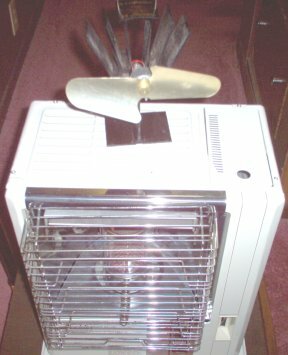 This all-metal fan can sit on top of a heater and help distribute the heat. 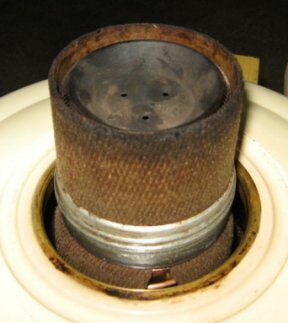 Note the vents on top: air is pulled down through the top, cooling the electric motor, and then blown through the circular 1/2" gap at the base of the unit, thus circulating heated air slightly toward the floor. 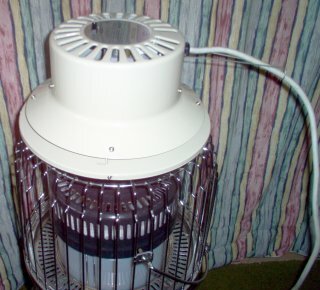 Note also that the electric cord is suspended on a wire rack to keep it away from the most intense heat. From my collection. Moonlighter reflector. Shown sitting on top of a DC-100. 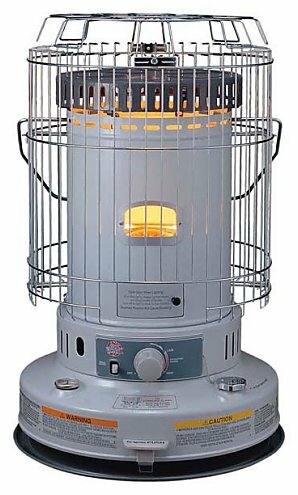 This reflector is designed to fit behind the glass chimney on a Moonlighter heater, reflecting heat toward the front while allowing the heater to be closer to a combustible wall or furnishings. 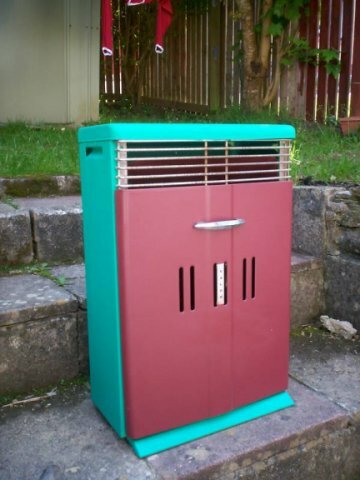 The reflector is stainless steel with an insulation air space and an enameled back panel. It was designed to be attached to the grill. From my collection. 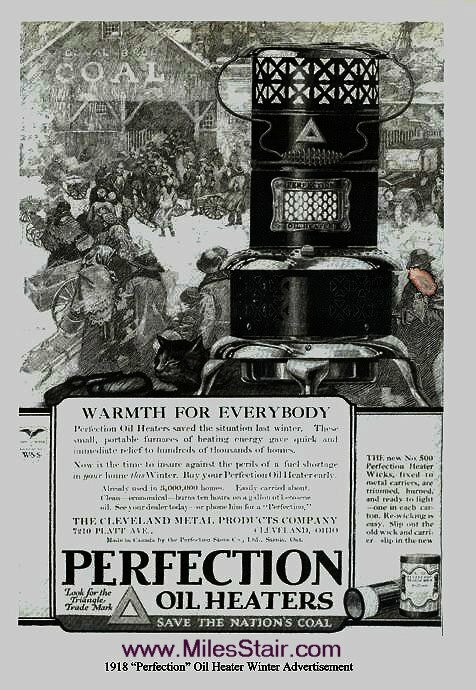 1918 Perfection heater advertisement. 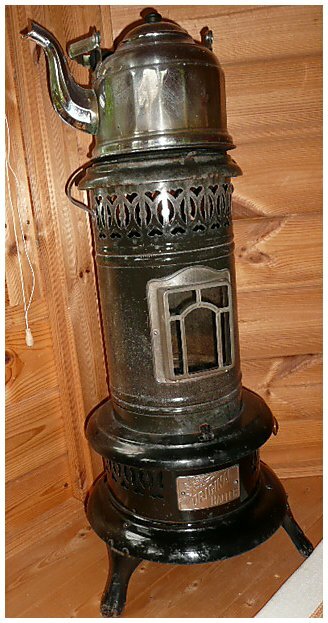 Note the thrust of the advertisement: A kerosene heater allowed a family to avoid crowds obtaining coal to heat their homes and thus avoid the influenza pandemic which ravaged the world, killing at least 20,000,000 people. And now we have the possibility of an avian flu pandemic that could be far worse than the one in 1918!!! From my collection. 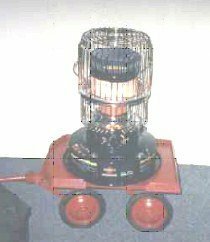 "Auto Motor Heater" from my collection. 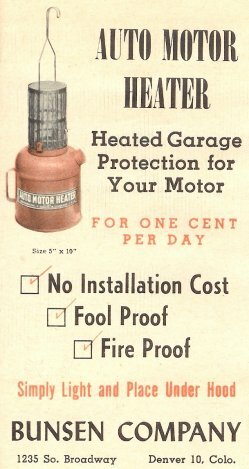 Auto Motor Heater diagram from my collection. 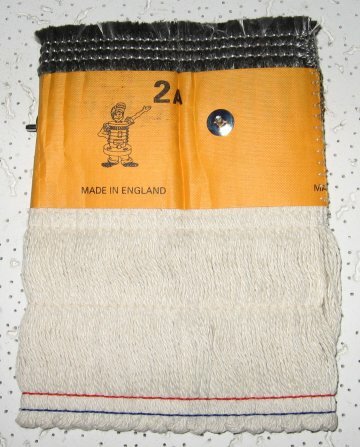 photo, and available asbestos Priming Wick. 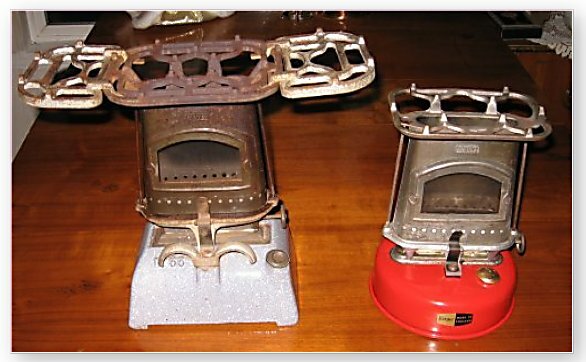 Mini Kerosene Heaters (Brooder house, well pump house, etc) From my collection. 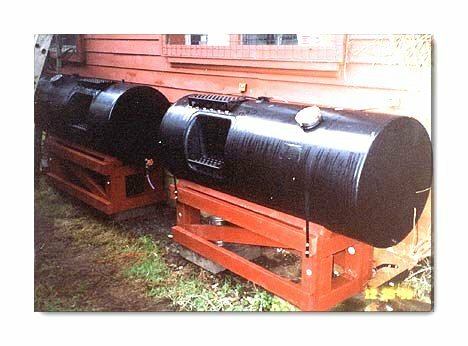 Diesel truck tanks for kerosene storage (Old steel Mack truck 110 gallon tanks salvaged (i.e., free). I cleaned them up, painted them, then put them on cradles built from pressure treated 4 x 4'x and 2 x 4's for cross bracing. 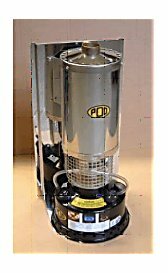 A boiler valve with 1/2" clear vinyl tubing allows containers to be filled by gravity flow. They have worked like a charm since I set them up in 1999. 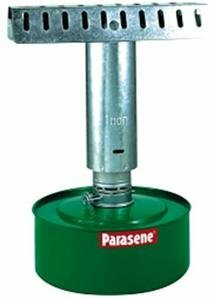 Alphabetical list of most kerosene heaters and the proper wick, & cart checkout. 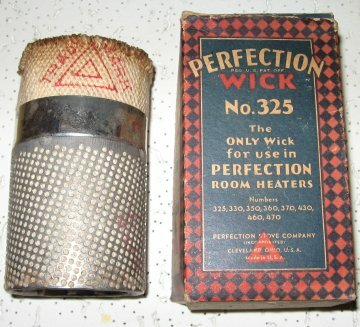 List by wick number and the heaters that fit them. 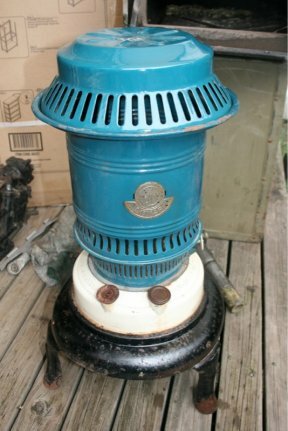 Kerosene Heaters - General types, how they work, recommendations for some good ones - and those I would avoid. 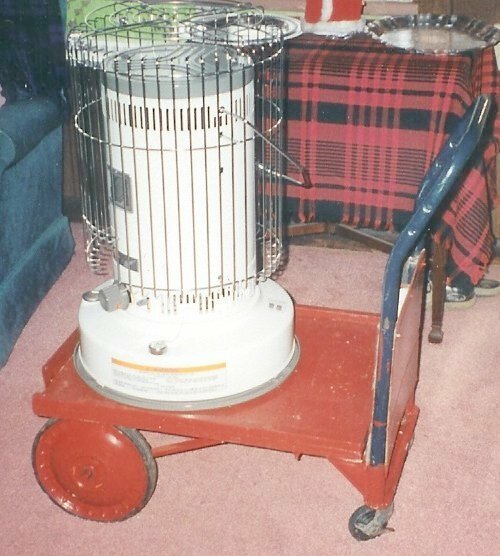 why carry your heater around? 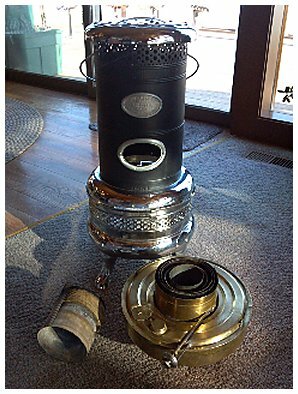 "Sans Rival" borosilicate chimney for 14''' Kosmos lamps New! 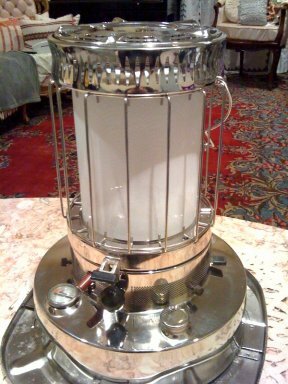 Photos of restored center draft lamps. 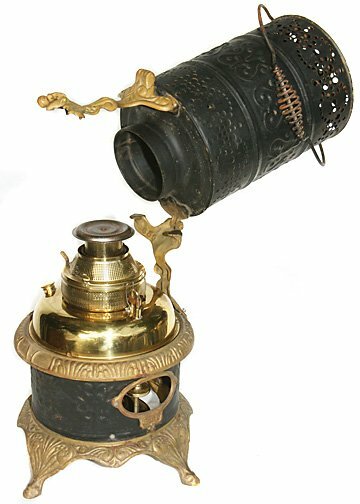 Aladdin Lamp History - Aladdin Lamp Wicks & Chimneys, Exploded burner views. 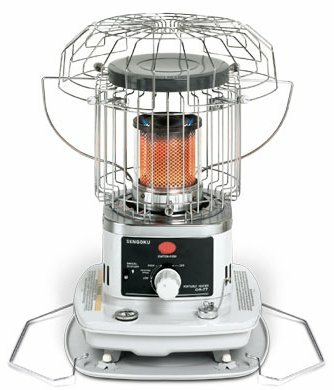 Kerosene Stoves - Recommendations on different models New! 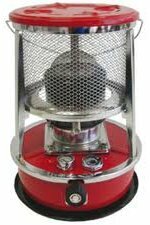 Butterfly A-822, 22 wick, all-aluminum premium stove. New! Butterfly #2487, 16 wick stove. 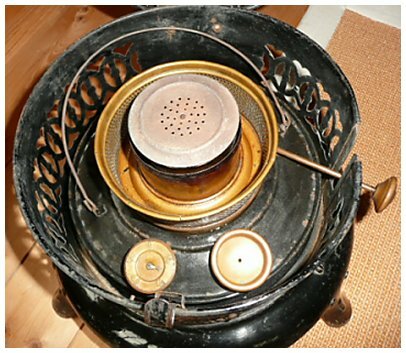 instructions for virtually any pressure stove. 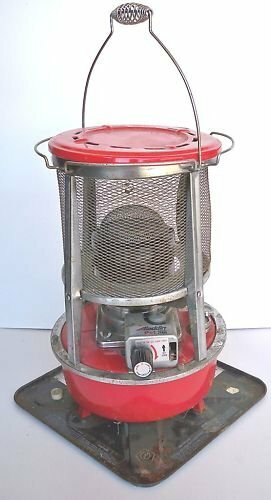 good with any gravity flow stove. 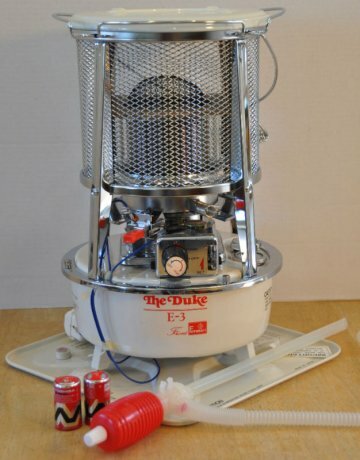 the least expensive emergency stove. 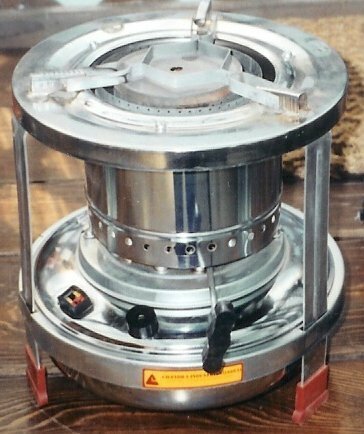 THE Best Heavy Duty Cook Stove. 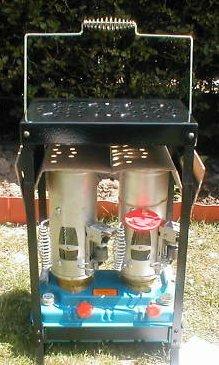 same for most pressure lanterns.